After making the white ones, I also made a red and green house. The red house is painted with DecoArt Country Red and the green house is painted with Foliage Green. 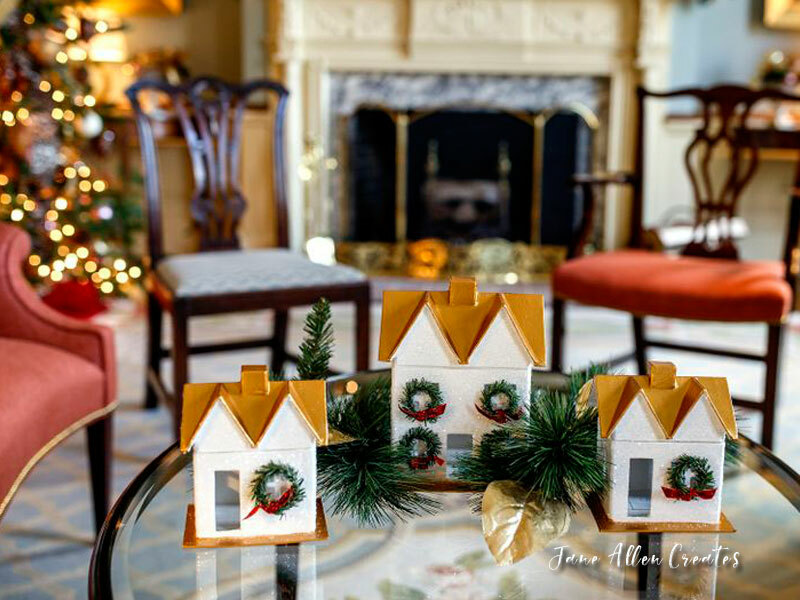 Bloom’s helped to decorate the PA Governor’s house for Christmas this year. The Theme was White Christmas and they were decorating the living room. They used three of my glitter houses in the living room on the center coffee table. I was tickled to have them be a part of the decorations for the Governor’s house this year. A picture of the houses was used on the front of the open house video and post cards. Here is a picture of Mark and Mrs. Wolf (the Governor’s wife) while they were decorating. I am sorry that I don’t have a better closeup picture of the white houses, but I was in a big rush to get them to Mark and forgot to take pictures. Hope this inspires you to create some new glitter houses this year. PS. If you are in the area you will definitely want to stop into Blooms and see all thier wonderful decorations. There address is 2125 Market Street, Camp Hill, PA 17011. Love the glitter houses, Jane! Hard to pick a favorite one! I have a set waiting on my to “someday do” list. You’ve given me inspiration to get going! Beautiful job! Merry Christmas and a Blessed New Year! Thank you Roxanne, they are a fun project to do and these are quick to do. You also have a Merry Christmas and Blessed New Year. Beautiful my friend…..fitting for the home. Love all. I love these house and I just love glitter.The gold really gives them a different look. So elegant. I have several to paint but thinking they will have to wait for next year. I will be making gingerbread houses when I get to Texas. Love the gold roofs Jane! Very stately. Beautiful Jane, they look so elegant. Merry Christmas to you and yours. What an honor Jane. All that glitters, all that you do warms my heart. You are amazing. Thank you for all you share with all of us. You inspire me to continue to try new things and new art mediums. Where can the house blanks be found. I looked at Hobby Lobby and found none.